I find I can barely type these words. As many of you already know, Architect Bob Hull, founding member of the Miller Hull Partnership, passed away from a catastrophic stroke in South Africa on April 7. He and his wife and true soulmate, my dear friend Beanne, were there for three months visiting Beanne's family. The loss of Bob is enormous on so many levels--the community of family, friends, colleagues that he impacted is as deep as it is vast. His intelligence, talent, humility, charm, and fearless enthusiasm for everything that life had to offer endeared him to all. Bob was also a very good sketcher, as is Beanne (we often sketch together), and I gave him a set of watercolor graphite pencils to use in South Africa just before they left. 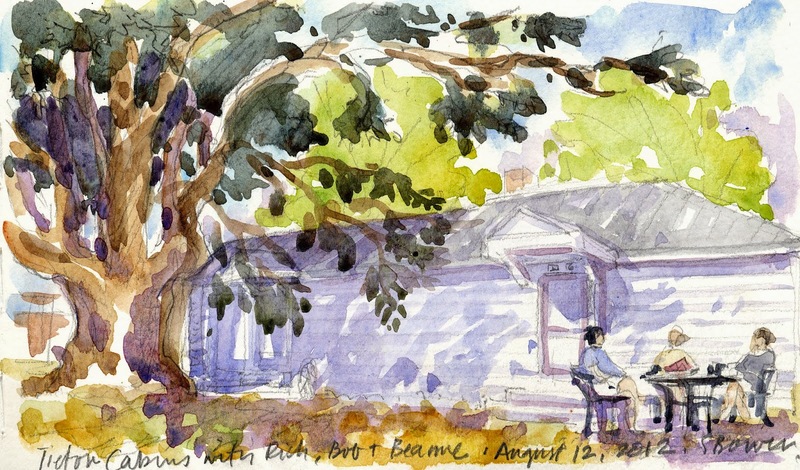 Today as I struggle with this loss, I am compelled to post a sketch made in August of 2012 -- a sketch of Bob, Beanne, and my husband Rich in front of the cabin we shared in Tieton, WA. If I remember correctly, Bob slept outside under the stars, of course. The act of sketching imbeds memories so deeply...as I look at this sketch, I can feel the crisp sun, the dry Tieton air, the bright morning as we sat outside sipping coffee in the sun, looking over maps and planning out our day...and laughing, always laughing. Bob was so curious about everything. When a total stranger walked within 30 feet of us, he called out with a robust "Good Morning" and engaged the fellow in conversation. He was always much more interested in learning about others than ever talking about himself, even though he was so very, very accomplished. Later that afternoon, we would float in a raft down an icy river, sip cocktails and sketch and swim along the riverbank, explore an amazing abandoned barn, and join a large group of their friends for an amazing candlelit dinner outdoors. Bob had friends everywhere, really good friends. Bob Hull will be missed by so very, very, very many. His was a life well-lived, and I am so grateful to have known him and loved him. This sketch is my small way of honoring him today. Rest in peace, dear friend. Thanks for sharing that. I was shocked to hear of his death yesterday when a friend passed on the information. Yes he will truly be missed in the architecture community. I did not know him but appreciated the architecture of Miller Hull. Please pass on condolences to his family. Thanks so much for this message, Gail. I will indeed pass this on. There is a caringbridge site that Bob's son started in order to post messages to the family...it is http://www.caringbridge.org/visit/notesforbobhull and is open for anyone to send a message. He will indeed be very missed. Oh Stephanie that was such a beautiful tribute. I am sorry for your loss. Thank you, Mark...I think we are going to be hearing a lot of warm and endearing stories about this man in the next weeks. To truly live is to share life with people. Do not think that his passing leaves you poorer, but that his life has made you richer. Thanks, Mike--indeed, you are absolutely right. We are all indeed richer for having known Bob.